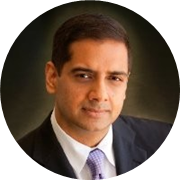 Prior to joining Pratt & Whitney, Sudeep served as vice president and general manager of the Global Digital Transformation business at Hewlett Packard Enterprise, Enterprise Services (HPE). In this role, he drove thought leadership and customer engagements worldwide to help clients along their transformation journey to becoming a digital enterprise. Sudeep also held executive positions at Cognizant and Infosys. Sudeep received a bachelor’s degree in Computer Science & Engineering from Bangalore University and holds a Master of Business Administration from the University of Texas. He is also a graduate of the Executive Management Program from the Wharton School of Business. · A digital vision and blueprint: What does digital transformation mean to Pratt & Whitney? Check out the incredible speaker line-up to see who will be joining Sudeep.